If you are contemplating buying new, or about to replace your old sash windows, our comprehensive guide to how much sash windows cost, can not only help with prices, but may also give you a broader knowledge of the market and potentially save you time and money. Here is our ultimate guide to Sash Windows. What exactly is a Sash Window? What affects the prices for Sash Windows? The Sash window (as we know it) has been around since the late 1600’s, and the widely accepted definition describes them as either vertical sliding sash windows, hung sash windows or box sash windows. The sash is the moving panel of the window and, unlike other types of windows, the key feature is that the sash moves vertically within the frame. Single hung have 1 moving panel, usually the lower. 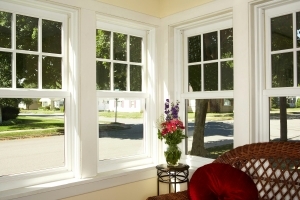 Double hung have 2 moving panels – top & bottom. Triple & quadruple hung, although rare, can be made to order. A box sash window is just really another name for the sash window in the UK, but is used more often when describing timber sash windows that have “heavier” frames and a more traditional appearance. Horizontal sash windows (side to side opening) are in the market, but are not that popular in the UK. The weight of the vertical moving sash is counter balanced to make it easier to move. Original designs had the counterbalance built (hidden) within the outer frame and consisted of a cast iron or lead weight connected to the sash via a rope & pulley. Modern sash windows can use tensioned spring balances. What are the different types of materials that can be used to make sash windows? A traditional sash window would be made from timber. 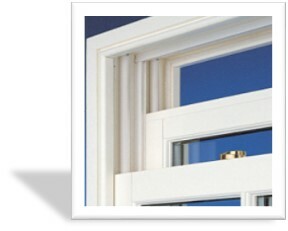 A modern alternative to timber is a uPVC Sash Window – both have their pro’s & con’s. Timber sash windows can be made completely from softwood or hardwood. You can also find them with softwood frames but with hardwood inserts, such as cills. Of late, due to the amazing advances in timber technology, engineered woods are becoming more frequently used in the crafting of timber sash windows. Engineered wood has a number of features that give it an advantage over “natural wood” when used for sash windows. Engineered timber is very stable and made from laminated “cross grain” sections of wood, which greatly reduces the effects of shrinkage, warping and expansion – 3 of the most commonly reported problems experienced with wooden sash windows. UPVC Sash windows can be made with much slimmer frames than those of a traditional wooden example, allowing for a less bulky look. UPVC is known for its long life and low maintenance. With the improvement in design and manufacturing processes, uPVC Sash windows can offer wood-effect surface finishes that give the window a properly authentic appearance. Combine that authenticity with an extended choice of colour and you have an excellent alternative to wood that is well worth considering. What affects the cost of different types of sash windows? There are lots of elements that can impact upon sash windows prices, some are immediately apparent, some not so. Here is a brief summary of some of those factors. Firstly, let us say that Sash windows are not the cheapest design. Some timber sash windows can be quite expensive to replace. In many cases, where there are no covenants, planning or aesthetic reasons to compel property owners to fit sash windows, this has lead to homeowners replacing the original sashes with casement windows. Hand built timber sash windows are going to be right at the top end of price points – so much work goes into making them and they look so good that the cost is very often justified. 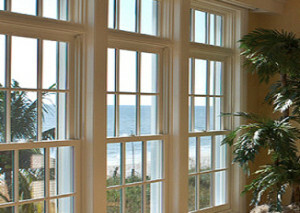 Full softwood windows will usually be less expensive than any window using hardwood. Engineered wood products, depending on the manufacturer may sometimes be a little less expensive, but not always. UPVC is a low cost material to produce, and can be fabricated easily into sash windows, so the relative cost is likely to be lower than for the same sized timber window. It’s a fact of life, bigger costs more. Expect to experience “The larger your window is, the more it will cost” – unless you are ordering multiple windows at once, when you are likely to find the actual cost per window can come down based on the size of the order. A standard window height in the UK will be around 1200mm (or 4 feet) and the usual width of a standard individual sash window unit can also be in the region of 1200mm. The reason this could be important is that anything over these dimensions for an individual unit may be considered as “bespoke” by a manufacturer and therefore come with a premium cost as the sashes may need to have extra strength built in to meet with the demands of the functionality. Larger window openings can be catered for by using multiple adjacent sash units. 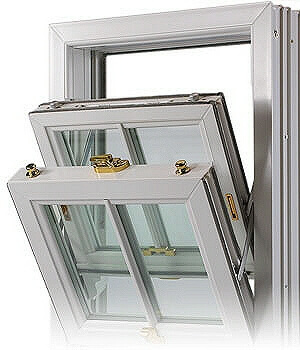 Trickle vents for double glazed sash windows are also important. Trickle vents are there to specifically combat condensation build-up in well insulated homes. A typical sash window will have 2 sashes and you can choose to have one (single hung) or both (double hung) open and close. For windows of a large height you can fit triple or quadruple hung sections, but that’s not going to be cheap! It’s unusual in this day and age to fit single glazing in an external window. But there may be instances, quite common in period homes, where a planning restriction enforces it. In that circumstance it is usually backed up by internal secondary glazing to keep the energy efficiency up and sound pollution down. 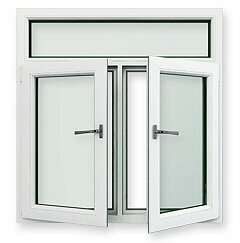 Double glazing is the usual standard for most replacement windows (triple glazing is an option). 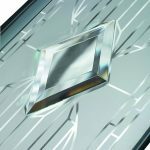 Using low emissivity glass and gas filled sealed units improve energy efficiency, but also push up the price. If you require it, patterned, leaded, frosted or otherwise “special” glazing can be fitted. White upvc sash windows are obviously available, but there are coloured versions in the market.with about a dozen different colour options including wood-effect finishes. With timber, it’s easy, you can paint or stain it to any colour you like. Prices shown are for guidance only. 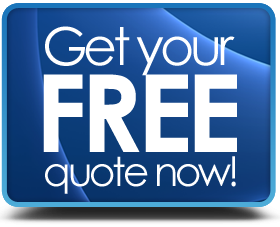 Always get a quotation from a reputable supplier, as prices are subject availability and to the specific requirements of your installation. Should I go for Timber or uPVC Sash Windows? Am I allowed to install uPVC sash windows instead of timber one? Should I choose to Install uPVC sash windows instead of timber ones? In the first instance you should firstly find out whether there are any restrictions in the local area or on your individual property as to what you can or can’t install. Listed buildings, historical properties, houses in an area of outstanding natural beauty or national parks could well have some sort of rule or regulation governing the type of home improvements that can be done – and how they should be done. Give your local planning department a call and they should be able to tell you. In the second instance, if it’s just a matter of personal choice it’s a good idea to weigh-up the pro’s & cons of each before deciding on which way to go. White Upvc can sometimes look just like white Upvc – cheaply made windows from low grade Upvc can look awful & “plasticky”. Use a product with high grade materials. Having said that, wood-grain effect and colour options for modern Upvc sashes can look authentic and do the job very well. Timber looks like timber – and for the “purist” there is no substitute. Hardwoods and new engineered woods give the latest products super appearance and long lifespans. There is also the fact that timber can be worked into finer detail. Glazing bars and windows horns look slightly more elegant and not so much as an afterthought. Softwood timber sashes need a lot of looking after. Hardwoods and engineered woods no so much, but you will need to paint or stain them on an ongoing basis if you want timber windows to last 20 years or so. UPVC sashes have an exceedingly long working life and need very little looking after. Believe it or not, timber sash window frames are almost at good at insulation as Upvc frames, so they are evenly matched (more or less). The biggest energy efficiency difference is made with the glazing. Old timber sash windows were single glazed, so just changing it to double glazing will make a huge difference. This is an area where uPVC is very often the lower cost option of the 2 materials. If you look at the supply only cost of a similar window for both uPVC and timber, then the UPVC sash windows cost is usually somewhat lower. The debate about uPVC Vs Timber sash windows is going to continue long after we are gone, but the consensus of opinion that we have observed is that timber sash windows are the favoured design where the buyers’ budget allows. People will replace timber with timber where the quality of the product is important and the replacement must not “take away” from the existing aesthetics of the home – particularly in period properties. UPVC sash windows become more favoured in new-build or where windows are being replaced in a “contemporary / modern” style home or when the style of the house is suited to sash windows but the buyer has less of a budget to do the work. Should I renovate my sash windows? Sash window renovations are mostly carried out on timber installations, and or the purposes of this section, we will be referring to timber sash window renovation. Wood rot, fungus (or worse) in the frames or sashes. Sash ropes frayed, broken or otherwise non-functioning. Over painting throughout the years (painted shut!). Rarely are any of these ailments “terminal” on their own, but if you have all of them at once, then it could be more time & cost effective to replace the whole window. Sealing draughts, repainting timber & glass repairs can be effected quite easily by an experienced trades-person. But even replacing a sash cord is not a job for a novice, as getting to it can be tricky and you could cause more damage to the window simply trying to access the inner sections of the frames. Our recommendation is not to tackle the refurbishment on your own unless you are highly skilled and experienced carpenter yourself. The last thing you want is to end up spending a lot more time and a lot more money than you bargained for. Parting Beads are vertical seals. A wag tail is a strip of wood inside the window frame. A Stile is the vertical side part of the frame. An Apron is a section of cladding to decorate the bottom of the window. How much does it cost to renovate a sash window? 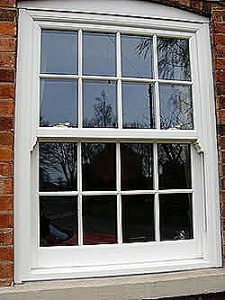 Repairs for a timber sash window don’t come cheap, you are paying for an expert to come and asses the work needed, supply the materials and then carry out the refurbishment – even replacing a cill can cost from around £100 in some places. If the work is not major, then you should expect to pay no less than around £250 for a basic “overhaul”.